Heat oven to 450ºF. In large bowl, stir biscuit ingredients until soft dough forms. Drop dough by heaping tablespoonfuls onto ungreased baking sheet. Bake 8 to 10 minutes or until golden. Meanwhile, in ungreased 15x10- or 13x9-inch pan, toss roasted vegetable ingredients until evenly coated with oil; arrange in single layer. 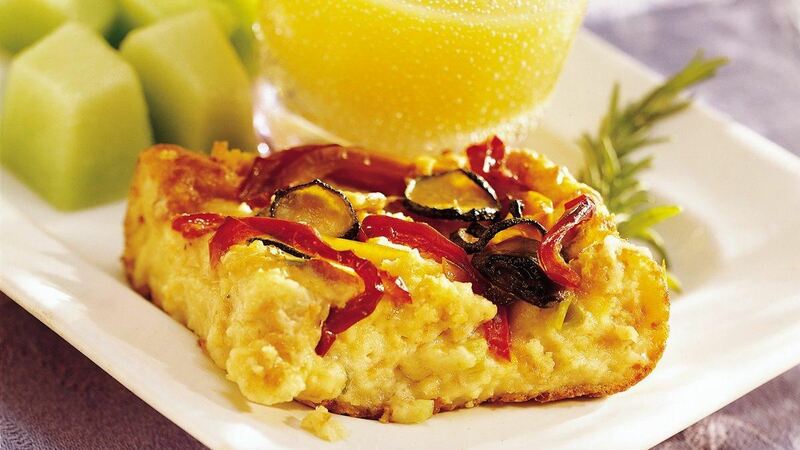 After removing biscuits from oven, bake vegetables 15 to 20 minutes, stirring occasionally, until crisp-tender. Cover vegetables; refrigerate until needed. Meanwhile, in large bowl, beat eggs, milk, oil and pepper with wire whisk or electric mixer on low speed until blended. Break biscuits into random-sized pieces; spread in ungreased 13x9-inch (3-quart) glass baking dish. Pour egg mixture over biscuits. Sprinkle with onions and cheese. Cover; refrigerate at least 8 hours but no longer than 24 hours. When ready to bake, heat oven to 350ºF. Stir biscuit mixture in dish. Top with vegetables. Bake 1 hour 10 minutes to 1 hour 25 minutes or until top is golden brown and knife inserted in centre comes out clean. Serve warm. Substitution: No rosemary? Dried basil leaves makes a flavorful stand-in.